A driver who caused the deaths of two men after he bent down to pick up a mobile phone has been jailed for six years at the High Court in Edinburgh. 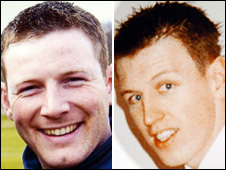 Hugh Cowie had no licence or insurance when he drove his father's car into a works van, killing Jonathan Laughran and James Easton, who were both 24. The crash happened in May 2007 on the A752 near Gartcosh, North Lanarkshire. 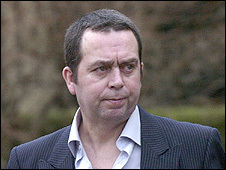 Cowie, 50, was also banned from driving for 12 years and ordered to re-sit his test before driving again. The former merchant navy veteran was convicted last month of causing the deaths of Mr Laughran and Mr Easton by dangerous driving. The court heard how he bent down and tried to retrieve the phone from the car footwell while it was travelling at about 50mph and failed to maintain observations and proper control. When paramedics arrived at the scene Cowie told them he had a mobile phone on the dashboard which rang and then fell to the floor. He said he bent down to pick it up and claimed that was the last thing he remembered. Cowie was also convicted of possessing heroin after a bag of the drug was found in the driver's door. He admitted further charges of driving the Peugeot car without the owner's consent, without a licence and without insurance. Passing sentence, judge Lady Stacey, pointed out that Cowie had a poor record, including offences of driving while under the influence of drink or drugs, driving while disqualified and for possession of drugs. "You had no business to be driving your father's car on 10 May 2007," she said. "You had no permission to do so, you had no licence and you had no insurance. "Your driving, which the jury found fell far below the standard of a competent and careful driver, caused the deaths of Jonathan Laughran and James Easton. "They were two young men, going about their work, whose untimely deaths have caused devastation to their families and to their friends. You know that, and you will require to live with that knowledge for the rest of your life." Colin Laughran, 53, whose son Jonathan died in the crash, said the sentence given to Cowie was "too lenient". "This has absolutely destroyed my family. I will never see my beautiful, beautiful boy again," he said. "Considering that this man never had any regard for the law before what is going to deter him now." Mr Laughran has launched a petition over what he perceives as the leniency of sentences in dangerous driving cases. It has attracted more than a quarter of a million signatures.